Bring some Smarties® fun into your life! Yummy smooth milk chocolate sweets covered in colourful crisp sugar shells. Each Nestlé® Smarties® Hexatube contains red, yellow, green, blue, violet, pink, brown and orange Smarties® - what's your favourite? These convenient resealable Smarties® tubes offer the ideal no mess treat when you're out and about. Release the colourful fun of Smarties®. Deliciously smooth milk chocolate has been at the heart of Smarties® for more than 80 years and, in 2005, Smarties® were the first UK major confectionery brand to move to no artificial colours - more reasons to enjoy Smarties®. We select only quality, 100% certified sustainable cocoa beans through the Nestlé® Cocoa Plan ®, which aims to improve the lives of cocoa farming communities and the quality of their products. 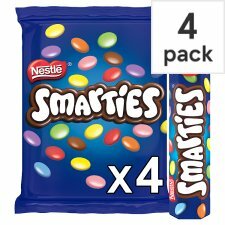 Enjoy Smarties® as part of a varied, balanced diet and a healthy lifestyle. Each 38g tube contains two portions (16 sweets per portion), so why not share with a friend or save some for later. 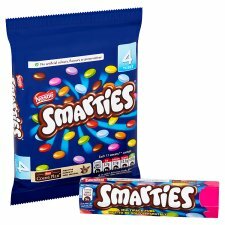 Have you tried our Smarties® Cartons and Sharing Bags, filled with everyone's favourite colour Smarties®, perfect for family film nights or sharing with friends. And, if you love Smarties® chocolate, then get ready to experience chocolate heaven with Smarties® Sharing Block - yummy smooth milk chocolate Smarties® covered in more yummy milk chocolate! Smooth milk chocolate sweets covered in colourful crisp sugar shells - which colour are you?